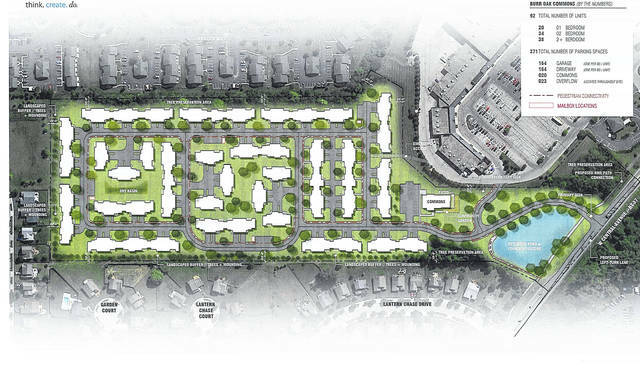 The proposed site plan for Treplus Communities’ Burr Oak Commons shows the layout of the planned 25 buildings that would provide 92 apartment units for seniors on the city’s west side if final approval is granted by Delaware City Council. The Delaware Planning Commission has signed off on the final development plan. Pending Delaware City Council’s approval, Treplus Communities will be bringing its apartment community for people age 55 and older to the west side of Delaware. During Wednesday’s Delaware Planning Commission meeting, members voted unanimously to recommend to council approval of a final development plan for Burr Oak Commons, a 25-building complex featuring 92 apartment units to be built on 20 undeveloped acres on State Route 37, between the Westfield Shopping Center (Kroger) and the Lantern Chase subdivision. Zoning Administrator Lance Schultz said of the planned 92 apartment units, which would be between 1,200 and 1,600 square feet, 20 would be one-bedroom units, 34 would be two-bedroom units, and 38 would be two-plus bedrooms. “There would be a lot of amenities in these apartments that would be tailored for the empty-nester,” he said. As for the site itself, Schultz added, the final development plan calls for a main access drive off State Route 37, a secondary access drive from the community to the western side of the Westfield Shopping Center near The Jug Grill and Patio, and an emergency access drive from the community to the back side of the shopping center. He added that construction is expected to begin, pending council approval, early next year and would include the extension of the bike path along State Route 37 to include the Treplus Communities property. Efland said while he’s “fully in support of this development,” he acknowledged both the city and Treplus Communities are working to address the final conditions the commission included in its recommendation for approval of the final development plan. The issue that drew the most feedback from the commission and city staff centered around Treplus Communities’ decision to forego the recommended Delaware blue vein limestone for the buildings in favor of tan synthetic stone veneer ledge stone walls and wainscoting. Jane Arthur Roslovic, managing member of Treplus Communities, said while there are no issues with using the Delaware blue vein limestone in other areas throughout the development like the main sign facing State Route 37, sticking with their own stone for the buildings is a branding issue that helps set Treplus Communities — which has locations in Dublin and Pickerington — apart from the competition. Commission member Jim Halter said he’s concerned with allowing a different type of stone to be used since the commission has held its ground in the past when approached by contractors wishing to use a different stone. After discussing the matter, commission members passed a motion allowing for the condition laid out in the final development plan approval recommendation to allow Delaware blue vein limestone or an equivalent ledge stone as approved by staff to be used on the 25 planned buildings in Burr Oak Commons. https://www.delgazette.com/wp-content/uploads/sites/40/2017/12/web1_Burr-Oak-Site.jpgThe proposed site plan for Treplus Communities’ Burr Oak Commons shows the layout of the planned 25 buildings that would provide 92 apartment units for seniors on the city’s west side if final approval is granted by Delaware City Council. The Delaware Planning Commission has signed off on the final development plan.